Tiomkin’s affinity for scoring heroism and pageantry, played out on the broad stage of history, was never more fully realised than in director Anthony Mann’s The Fall of the Roman Empire (1964), with Sophia Loren, Stephen Boyd and an all-star cast. With the murder of Marcus Aurelius (Alec Guinness), his unstable heir Commodus (Christopher Plummer) claims the throne, and the decline begins as a tarantella-like motif gives way to the ‘Fall of Rome’ theme. 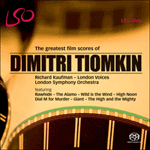 The epic movie offers barbarians at the gates, death raining down by fire and spear, poison and plague, all aided by Tiomkin at his ominous best. His Oscar nomination was the only one the three-hour epic received.